1-78th Field Artillery Battalion trains and develops adaptive soldiers to provide effective and timely fire support. Supports the design of fire support training in order to provide the Army with combat ready, Field Artillery Soldiers. On order, 1-78th FA conducts other training and support as directed by 428th Field Artillery Brigade. A Gold color metal and enamel device 1 13/32 inches (3.57 cm) in height consisting of the shield, crest and motto of the coat of arms. The field is red for Artillery. The gold billets are from the arms of Franche Comté, the canton from the badge of the parent organization. The crest is the divisional shoulder sleeve insignia charged with the number of the regiment. 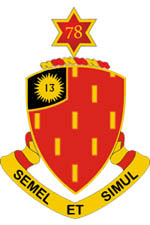 The distinctive unit insignia was originally approved for the 78th Field Artillery Regiment on 20 April 1928. It was redesignated for the 78th Field Artillery Battalion (Armored) on 2 January 1941. It was redesignated for the 78th Armored Field Artillery Battalion on 20 April 1954. It was redesignated for the 78th Artillery Regiment on 17 November 1958. The insignia was redesignated for the 78th Field Artillery Regiment effective 1 September 1971. SEMEL ET SIMUL "At Once and Together". 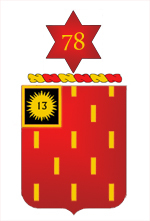 Gules, billetté Or; on a canton of the last voided Sable, a sun in splendor of the second charged with the Arabic number "13" of the third (for the 13th Cavalry). The field is red for Artillery. The gold billets are from the arms of Franche Comté, the canton from the badge of the parent organization. On a wreath of the colors Or and Gules, a six point mullet Gules charged with the Arabic number "78". The crest is the divisional shoulder sleeve insignia charged with the number of the regiment. The coat of arms was originally approved for the 78th Field Artillery Regiment on 16 May 1921. It was redesignated for the 78th Field Artillery Battalion (Armored) on 2 January 1941. It was redesignated for the 78th Armored Field Artillery Battalion on 20 April 1954. It was redesignated for the 78th Artillery Regiment on 17 November 1958. The insignia was redesignated for the 78th Field Artillery Regiment effective 1 September 1971.